By improving visibility into database vulnerabilities and providing expert recommendations for remediation, Vulnerability Manager for Databases reduces the likelihood of a damaging breach, and saves money through better preparation for audits and compliance with regulatory mandates. 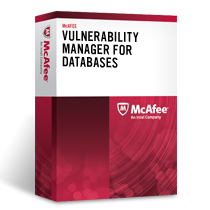 Vulnerability Manager for Databases evaluates risk from all known threat vectors and clearly classifies threats into distinct priority levels, provides fix scripts, and includes recommendations. McAfee ePolicy Orchestrator (McAfee ePO) software provides end-to-end visibility, detailed alerts and reports, and is fully integrated with Vulnerability Manager for Databases.